In 1960, Sergei Korolev, who until then almost single-handedly run the Soviet space program, suddenly found himself facing an ambitious rival -- Vladimir Chelomei. Chelomei started his career as a developer of cruise missiles for the Soviet navy, and, by the end of 1950s, had the ear of the Soviet leader Nikita Khrushchev. Preoccupied with the perceived military threat from the United States, Khrushchev in January 1960 urged Soviet rocket designers to conceptualize an aggressive military space program. Chelomei responded with a number of space projects with the primary goal of supporting and advancing the role of cruise missiles. He foresaw a network of satellites providing accurate and real-time guidance for cruise missiles, while missiles themselves evolving into faster vehicles and, ultimately, into manned space orbiters and gliders. Project "R" for Raketoplan, an automated and manned maneuverable vehicle capable of destroying enemy satellites and subsequent landing on the runway. A series of launch vehicles, capable of delivering all these payloads in orbit were under consideration at OKB-52. To sell his space doctrine to the Kremlin and the Ministry of Defense, Chelomei launched an aggressive lobbying campaign, and with the sympathetic ear of Khrushchev things promised to go smoothly. Chelomei first outlined his ideas before Khrushchev, apparently during Soviet leader's visit to OKB-52 in the company of top Soviet officials from Military Industrial Commission, Ministry of Defense, industrial state committees and Academy of Sciences. On April 25, 1960, Chelomei made a presentation on the subject to the Deputy Defense Minister A. A. Grechko. In turn, it led to Chelomei's meeting with the Minister of Defense R. Ya. Malinovskiy a day later. Finally, on May 10, 1960, Khrushchev hosted a meeting with Chelomei in the company of number of prominent Soviet officials, among them L. I. Brezhnev, F. R. Kozlov, R. Ya. Malinovskiy, D. F. Ustinov, I. D. Serbin. The latter meeting with Khrushchev reportedly had a positive outcome for Chelomei and four days later, on May 14, 1960, Chelomei discussed technical details of "his" space plan with his immediate bosses at State Committee for Aviation Technology, GKAT. In accordance with the standard Soviet practice, top aviation officials, P. V. Dementiev and A. A. Kobzarev instructed Chelomei to prepare a formal letter to the Central Committee of the Communist Party and a draft of a decree, detailing OKB-52's proposals on space technology. At the time of Chelomei's "grand entrance" into space program, Sergei Korolev at OKB-1 worked on a draft of a government decree for significant expansion of the Soviet space program, in line with Khrushchev's directives from January 1960. The document was ready on April 7, 1960, however Chelomei's proposals, which emerged at the same time, suddenly put Korolev's on defensive, as he saw a newcomer "usurping" manned space flight in the USSR. On May 30, 1960, Korolev fired back at Chelomei's claims to a prime role in the Soviet space program with a letter to S. I. Vetoshkin at Military Industrial Commission, VPK, and K. N. Rudnev at State Committee for Defense Technology, GKOT -- the Ministry in charge of Korolev's organization. In the letter Korolev said that "demands about consolidation of all work on orbital and winged vehicles within GKAT could not be considered correct." Instead, Korolev offered a new revision of the possible government decree, which would share responsibilities in the Soviet space program between OKB-1 and OKB-52. Section 4 of the Paragraph IV of Korolev's draft decree assigned OKB-52 the development of Raketoplan "for orbital missions around the Earth with maneuvering in orbit and landing at a predetermined airport, (Article R), with the following basic characteristics: mass 10-12 tons; the range of a gliding flight 2.5-3 thousand kilometers." The development schedule optimistically targeted the first flight of the unmanned version of the vehicle (later designed R-1) during 1960-1961, while the satellite destroyer version would take off during 1962 and 1964, and the first manned mission (Version R-2) had to be achieved in 1963-1965. On June 4, 1960, Chelomei defended his ideas again, this time to somewhat skeptical audience, than officials at "his home" ministry. The official history of the OKB-52 described meetings of 1960 as "rigorous" review of Chelomei's far-reaching proposals. However, it should be noted that with the favoritism typical for any large bureaucracy around the world, the Soviet industry officials often had to merely rubber-stamp the foregone conclusion that had already been made in Kremlin. In time, it would become obvious that such Chelomei's proposals as nuclear-powered space planes were hardly practical and far ahead of their time, to say the least. This is not to argue that Chelomei was not qualified to undertake the program he was embarking upon. After all, many of his contemporaries in space program, including Sergei Korolev and Wernher Von Braun left a vast legacy of overly optimistic and unrealized dreams. In any case, Chelomei's "armada" of spacecraft was given a green light, while his family of launch vehicles, designated "A" remained unfunded. On June 23, 1960, a decree of Central Committee of the Communist Party and the Soviet of Ministers gave go ahead to Chelomei's entrance into space program. To accomplish his goals in space, Chelomei split the main design department at OKB-52 into two teams, or "sectors." Sector "A," led by V. A. Polyachenko, would be responsible for the development of spacecraft and launch vehicles, while sector "B", led by Herbert Efremov, which would continue the traditional line of business of OKB-52 -- the cruise missiles. A. Tavrizov was in charge of the whole department. On October 3, 1960, the Soviet government gave Chelomei control over one of the most advanced aviation facilities in the country -- Plant No. 23 in Fili near Moscow. Along with the plant, Chelomei inherits a rich legacy of the most advanced aerospace projects and experienced cadre of Vladimir Myasishev's design bureau. Among many innovative ideas Chelomei receives from Myasishev's organization were recent blueprints of orbital gliders. Although in the following decades, the concept of a "kosmoplan" or a "space plane" would imply a winged vehicle to access low Earth orbit, Chelomei saw such vehicle as a craft for deep space exploration. Although Kosmoplan development went nowhere, the Raketoplan project proceeded further toward the creation of a diverse fleet of vehicles, including manned space gliders capable of landing on a regular runway and unmanned space interceptors, bombers and inspector satellites. The program apparently seek to respond to the similar developments in the US. Chelomei hoped to extensively use his organization's experience in the development of cruise missiles for creation of a new type of spacecraft. A standardized expendable heat shield advocated by Chelomei would enable a variety of vehicles to reenter the atmosphere. After discarding a heat shield, the Raketoplan would deploy its wings, not unlike cruise missiles developed at OKB-52. The development of the Raketoplan consisted of two major phases -- an unmanned prototype designated R-1 and the manned vehicle designated R-2. The development of the Raketoplan consisted of two major phases -- an unmanned prototype designated R-1 and the manned version, known as R-2. The R-1 would test all crucial systems of the future manned spacecraft, including attitude control, thermal protection, separation and propulsion systems, as well as its ballistic and aerodynamic characteristics. In the meantime, early manned missions were to test the role humans in surveillance and command and control functions from space. The biggest challenge OKB-52 faced in the development of a winged orbiter was flight control and thermal protection during the reentry. At the time, scientists knew little about complex aerodynamic and temperature process at high speed and altitude, while no wind tunnels or any other testing equipment existed to mimic such conditions on the ground. The MP-1 was designed for a stabilized flight at every stage of the mission and it would become the world's first vehicle capable of aerodynamic attitude control at the hypersonic speeds during the reentry. A sealed instrument compartment contained a flight control, telemetry, power supply, thermal control and pneumatic attitude control systems. The main body consisted of the cone and the cylinder. A tank containing compressed air was located in the nose of the vehicle. A pneumatic system would power graphite elevons for bank control located on the conical section of the vehicle. During the flight beyond the atmosphere, a system of nozzles also fed by the compressed air would be used for the attitude control. After the reentry the spacecraft would brake with the help of aerodynamic brakes located at the base of the vehicle in the shape of the umbrella. Three parachutes would be used to recover the vehicle for the post-flight evaluation of the thermal protection systems. During the flight, dynamic and temperature date would be transmitted with the telemetry and recorded onboard the vehicle. At the end of 1960, OKB-52 started the development of the MP-1, bypassing a preliminary design stage. In cooperation with TsAGI, LII, VIAM and NII-1, OKB-52 was simultaneously developing production blueprints, manufacturing subsystems, testing thermal protection materials, graphite-based nose fairing and braking mechanism in the high-temperature jet stream. The success of the MP-1 was followed by the development of the similar vehicle, but equipped with four titanium-based aerodynamic surfaces instead of speed brakes. Small liquid propulsion thrusters would be used for attitude control instead of the pneumatic system. A new multifunctional control system developed at KB-4 design bureau within OKB-52 controlled the flight stabilization and execution of preprogrammed maneuvers of the M-12 vehicle. 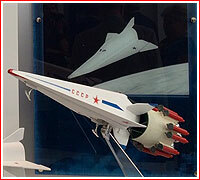 Along the Raketoplan program, the M-12 ought to benefit the development of the maneuverable "aero-ballistic" warheads designated AB-200, AB-500 and UB. In 1964, Chelomei (guilty by association with the deposed Soviet leader Nikita Khrushchev) fell out of favor with the new Soviet government. In the wake of the Khrushchev's fall, Chelomei's research into reusable vehicles, was ordered to be transferred to Artem Mikoyan's design bureau. There, Chelomei's work became a root of the Spiral project.